June | 2016 | What would Audrey wear? The past few months with nary a blog post have been….just what I needed. Blogging and engaging in social media and building an online presence are really cool tools that we can use these days to build our brands, get business, keep in touch, make new friends and so much more. but there is a definite downside. Sometimes life doesn’t move forward in a straight line. There are bumps, side steps, giant detours…and sometimes you look up and you’re not really sure where you are. I’m of the mindset that getting lost, sidetracked or confused are all just part of being human. But there’s this pressure with blogging and social media to a) always be having a great time, and b) know just where you’re at and be able to communicate it fully. That’s not realistic for most people 100% of the time. So this past year where I wasn’t really sure what I was doing or where I was going, it felt really good to unplug and just do my thing for awhile. And I did! I did my thing right into a group home for teenage girls where I love working! I did my thing by starting my masters degree in psychology, which I do online so I can work full time. My life is fuller, richer and 100 times more satisfying than it was last year, and I’m enjoying it so much. I am still doing image consulting on the side, and loving that too. 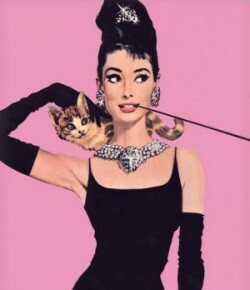 What Would Audrey Wear is still one of my favourite ways to use my time, and enriches all the other things I do. So we have a lot to catch up on! And we will. For now, I leave you with my new polka dot dress from modcloth. Have a great week!! !